One out of every ten people in China are carriers of the hepatitis B virus, who face rampant discrimination. Many carriers have chosen to fight the discrimination, with varying degrees of success. On World Hepatitis Day in July, hundreds of hepatitis B carriers gathered in downtown Chengdu in Sichuan province. Apart from raising awareness about hepatitis B, they were also demanding for equal rights. A non-contagious condition, hepatitis B is little understood in China. Hepatitis B can only be transmitted through blood transfusions, sexual contact, and from a pregnant mother to an unborn child. But even so, schools and employers, even prospective marriage partners, routinely discriminate against Hepatitis B carriers. One of them is 22-year-old Fang Ming. A recent college graduate, he applied for a job in the aviation industry and cleared various tests and interviews. "In November, my prospective employer rang me and told me to go for a medical checkup. I cleared all categories except for Hepatitis B. Based on that they said they were not going to hire me," he said. Fang Ming decided to fight back by bringing a lawsuit against his prospective employer. "I felt so miserable and upset. It was rampant discrimination. I had to protect my rights." Fang Ming sought legal advice, and his case has now been submitted to and will be heard by a court in Beijing. "There are laws to protect the rights of hepatitis B carriers. According to the law, employers cannot refuse to hire someone simply because he's a carrier. If rejected, victims have the right to legal action," said Huang Yizhi, a lawyer from Beijing Ruifeng Law Firm. "Many people here think that Hepatitis B is like hepatitis A. They are ignorant and fearful, thinking that they can contract the condition simply by working and eating with carriers," she said. Lawyers say that the willingness by Chinese courts to handle such cases is a sign of the country's progress in protecting individual rights. 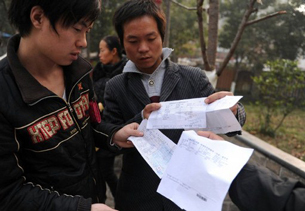 Victims often receive legal compensation, even though the amounts range only from a few thousand to 20,000 or 30,000 yuan. However some cases have also been unsuccessful as the onus and responsibility is on victims to produce evidence and prove beyond a doubt that they have been victimised and discriminated against. "The willingness of victims in protecting their rights can still serve as a warning and deterrence to employers, not just in terms of monetary compensation, but also the negative harm to the companies' image and reputation," said Ms Huang. In the past few years, hepatitis B carriers have campaigned for their rights in various ways. This includes displaying slogans and asking strangers for hugs in public places. He suspended his studies to campaign against hepatitis B carrier discrimination and has even sent an invitation to the Chinese prime minister to have dinner with him. But while perceptions have slowly been changing, shifting widespread public attitudes will certainly be a long term task.